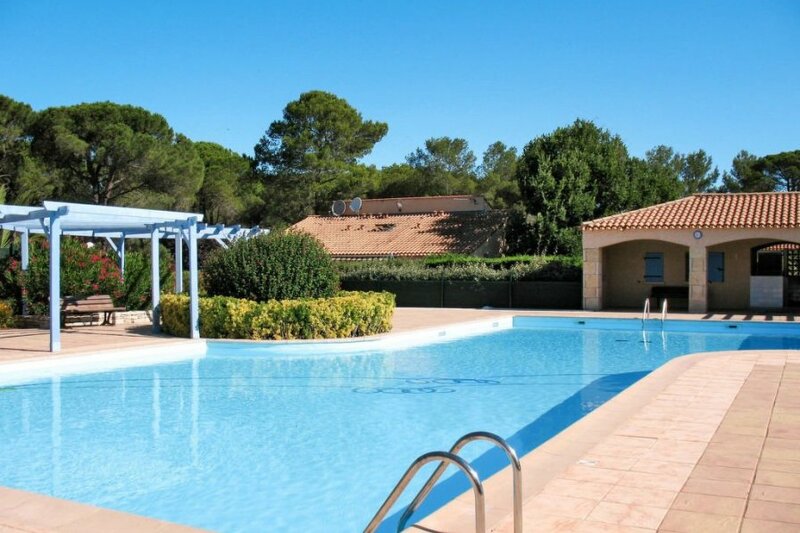 This 2 bedroom apartment with swimming pool is located in La Motte and sleeps 4 people. It has air conditioning. Terraced house, 4 people, 3 room/s, 2 bedroom/s, 1 bathroom/s, approximately 35 m², 2 floor/s. Feature: Property in a holiday complex (150 units in total). Equipment: satellite TV; washing machine, iron/ironing board; electric heating; air conditioning. € 15 per person and stay (depending on occupancy). Electricity according to consumption approximately € 0.18/​kWh. Holiday resort tax. Linen/towels must be brought along. Deposit € 200 (in cash). Pet not allowed. Estate (shared use with holiday guests): with plants, with garden. Pool (shared use): 18.0 x 8.0 m, 04/05/19-14/09/19, secured by a fence. Plot description: private part of the estate approximately 80 m², partially surrounded (hedge), gravel, palm trees. Access: no car-access to the property. Access to the house via footpath approximately 50 m.
Terrace 35 m² (sun-blind), furnishing provided, 2 sun loungers, electric barbecue, flattop barbecue. The apartment is described as good value for money. This apartment is located in La Motte. The nearest airport is 278km away. It is set in a convenient location, just 0 metres away from a beach and 4km away from the city center. There is a golf course nearby. The apartment is suitable for family friendly summer holidays; it is also suitable for elderly guests.